Seeds - Where Do You Find Puppeteers? Where Do You Find Puppeteers? 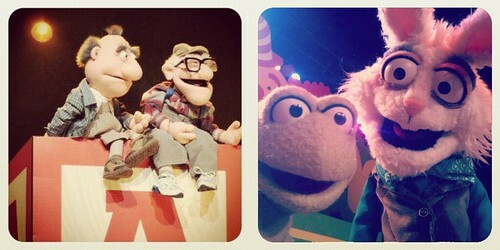 Puppets are a huge part of our services. Recently, the majority of our sketches have revolved around some of our favorite characters like above (from left to right): Fillmore, Millard, Ribbit & Watson. When we’re considering someone for puppeteering, we ask ourselves one thing: Can they do the voice? The ability to perform basic puppeteering skills is rarely in our thought process. Learning the mechanics of performing a puppet just takes time, reps, and the right instruction. These characters live or die based on their personality and the way they respond to situations. So much of that is about their voice. When you’re on the hunt, rather than just searching for people with puppeteering experience, look for someone who’s good with accents (British, Australian, Spanish, etc.) and character voices (old man, southern belle, someone with a lisp). Give THAT person a puppet. A new puppeteer can get away with a lot if the voice is interesting. I hope this helps. P.S. If you haven’t seen any of the sketches I referenced before, check ‘em out here.